For the first time in many races, Helms were faced with an anti clockwise course running from the Start Line between an Inner Distance Marker and Mark K, then beating down the lake to Mark D, tacking around D, leaving the Mark to Port, before starting downwind leg to gybe around Mark C and continuing the run to Mark B which was also left to Port, before starting the long leg, beating back up to Mark D (going through the start gate each lap). After a short delay to enable everybody who wanted to race to be helped into a boat (Many thanks to Andy Wallace for agreeing to a late change from his favoured Martin to an alien Stratos! Ed), the Race was underway. 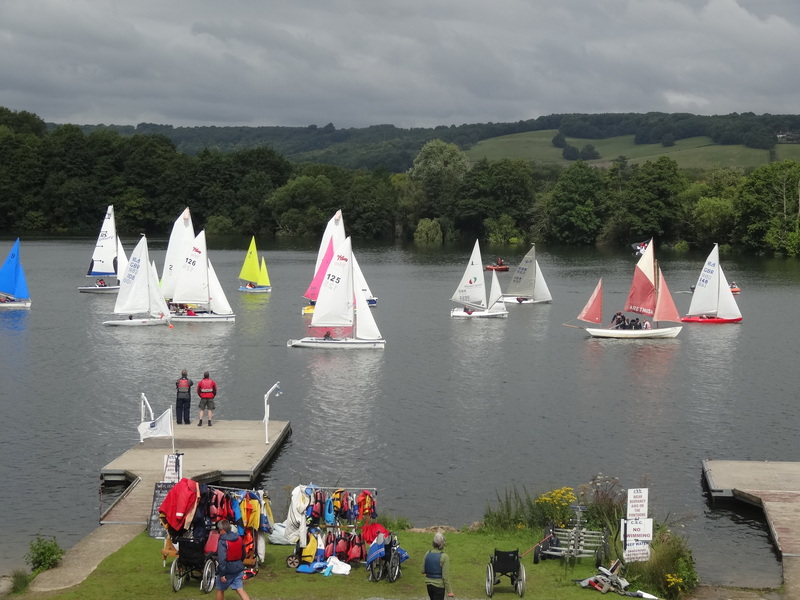 There is no doubt that WS Racers‘ starts are getting better, with everybody within a few boat lengths of the Start Line once the one minute Gong had sounded – as is evidence from the photograph below! Within a few seconds of the Start Gong sounding, the first boats were across the Start Line and tacking up to Mark D – led by Abe in the Commando! The first to show were Mike Blatchford in Martin 2290, Peter Gregory in 2.4m 148 (AKA The Red Torpedo. Ed), David Mason in his 2.4m 109 and Fay Watson and her crew James Thomas in their 303 with yellow sail #4. (The Pirate Lugger in the pic below was not in the race but may have been eyeing up any laggards as booty! Ed). The race also had two Stratos in the fleet; one helmed by Helen Fairfax – a volunteer – with Andy Wallace as crew and the other helmed by Bruce Hebbert – a Trustee. The sole Venture in the fleet was helmed by Paul Hagan with Allan Griffiths as crew (Paul – don’t get Allan to sign-on for the Race. The Race Controller didn’t know you were racing but fortunately the timekeeper recorded your lap times – thank you Bob Marsh!! Ed). The North-Easterly wind was blowing around 10 knots as these front runners began their beat up towards Mark D. The two 2.4m’s were best able to point high into the breeze and after a couple of tacks they were first around Mark D and building up a lead of some 200 metres over the third-place boat, by the time that boat rounded D. Perhaps not surprisingly in this breeze, the two Martins and the third 2.4m were the next group of boats to round Mark D to commence the downwind chase of Peter Gregory and David Mason in their 2.4m’s. What a good result for David Mason,and my goodness Fay as well….and Steve beating the Red Rocket!! All is changing…..
I’m still coming around after reading this information. Hopefully Bob will see this and it will aid his recovery. Peter don’t worry, I wont mention the fact that I have beaten you and Mike ….much. Thanks again for helping us to sail, such fun and I cant believe that I didn’t crash into anyone at the start. I have just heard from the Chair of Trustees : “Peter Wagner fell further and further behind the leaders as his 2.4 filled up with water…he split his keel on the edge of the pontoon as he powered up too quickly and then wondered why he was so slow…the boat is unfortunately now out of commission whilst J King Ltd explore repair options.” Nevertheless, well done Peter for persevering and still coming in 6th! !